England began their countdown to the Rugby World Cup with a victory over France at Twickenham that hinted at some promising times ahead for Stuart Lancaster's men. Two superb tries by Anthony Watson in the first quarter of the match gave England the advantage, but they were pegged back by three Morgan Parra penalties to leave the half-time score at 12-9. Another brilliantly worked try followed in the second half for Jonny May, only for the French pack to put the pressure back on, Fulgence Ouedraogo powering over from a lineout to cut the deficit again. High-profile debutant Sam Burgess made a number of bone-crushing tackles but blotted his copybook with a yellow card in the 35th minute. Burgess' first touch was a big tackle on Dimitri Szarzewski that would have calmed his nerves, but England were soon scrambling after a grubber by Remi Lamerat was hacked into the dead ball area only for an outstretched hand from Jonny May to prevent wing Brice Dulin from touching down. France fell just short with a succession of forward drives but were rewarded with a penalty that Parra sent between the uprights. England had barely touched the ball inside the opening 10 minutes but breached the whitewash with their first meaningful attack, started by a rolling maul that had Morgan as the driving force. When the ball was released, quick hands from Slade gave Anthony Watson a half-chance and the Bath wing accepted by showing a rapid turn of pace to round a terrible tackle by Dulin and dart over. Seven minutes later Watson scored his second after Burgess, Farrell and May combined in the midfield to create space that the 21-year-old turned into a try after a clever jink. Burgess flattened opposite number Alexandre Dumoulin with a wince-inducing tackle, but France continued their attack with Parra landing two penalties that sandwiched a barnstorming run by number eight Louis Picamoles. Slade was lucky to escape a yellow card for a tackle on Parra while the scrum-half was in mid-air, but Burgess was sent to the sin bin in the 36th minute with Parra involved once again. The crafty France playmaker took a quick-tap penalty and Burgess, who had not retreated 10 yards, pulled back his shirt in an act that exposed his lack of union nous. James Haskell emerged instead of Morgan for a second half that began in chaotic fashion, but by the 46th minute England had scored their third try with wonderful hands from Slade instrumental in keeping the move alive. Goode, positioned at first receiver, looked up and seeing the space chipped to the left wing where May gathered and strolled in. Clark was sent to the sin-bin for grabbing Guilhem Guirado around the neck while clearing a ruck and England were let off when substitute prop Uini Atonio dropped the ball with the line at his mercy. Fate was not with the World Cup hosts as the match entered the final quarter, however, as prop Kieran Brookes departed with a wrist injury just moments before Fulgence Ouedraogo touched down at the end of a line out drive that scattered white shirts. 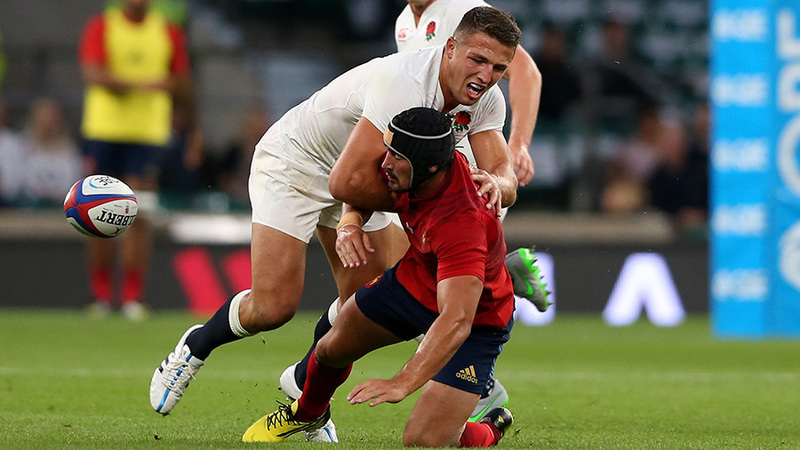 There were worrying signs for England's pack in the final quarter as the traditional source of Red Rose strength struggled at the set-piece, although the flurry of replacements hardly helped cohesion. Twickenham was silent as France launched a late assault knowing a try would seize victory, but James Haskell secured a penalty and the final whistle was blown.